Every Friday authors from around the world gather at the virtual fireside of fellow WordPress blogger, author Rochelle Wisoff to share flash fiction stories of 100 words, all inspired by a common photograph, and exchange constructive criticism. Readers’ comments are also welcome. This week’s photo has been graciously provided by E A Wicklund. … he just thinks he is. But what if you can’t convince him? What if you try to raise him – like a kite – to prove to him he ain’t heavy? And he just won’t make the effort. You hand feed him where he is, stuck on the ground. Encourage him to try for flight. And he just stands there – stupidly, idly (you never figure which) his mouth open for food. What if you then wheel away? This entry was posted in Dialogue, Short Story Writing, Writing and tagged Dialogue, Fiction, Flash Fiction, flash fiction, Friday Fictioneers, Online Writing, Short Story Writing, Writing. Bookmark the permalink. I took this to be more a metaphor for real life challenges. I really enjoyed it, Ann. We can’t assume all birds know how to fly or that they’re not afraid to take the first step. Trying to lift up someone who doesn’t want to be lifted up is heavy work, that’s for sure. A salient reminder that we can’t force someone to fly; only they can do it. A thought provoking piece. Did you leave out the two question marks on purpose? A gull’s punctuation lesson? After a time I think the burden of someone who will not lift a finger to help themselves becomes unbearable. Reminds me of current events. Not going there. Nice story. I’m glad you saw the photo prompt as ‘feeding the young’. I thought everyone would, but in reality few went down that path with it. Both birds seem to be juveniles so I couldn’t be certain that feeding is what’s going on. So I pretended. Thanks for reading. 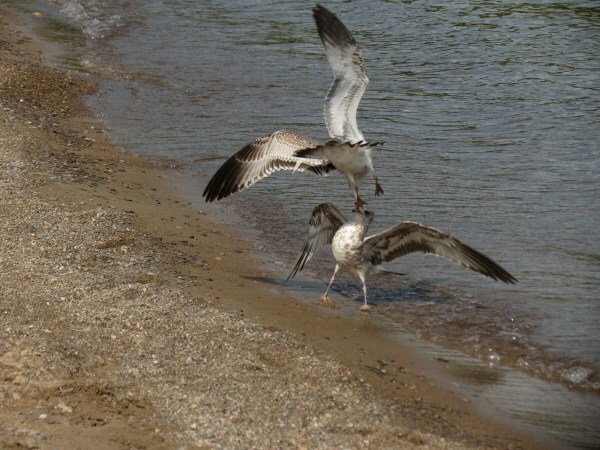 I like the flow here, but I’m curious, is this a dialogue between the gulls… or metaphor? Very interesting. Nice one Ann and you are in a dilemma aren’t you. But they survive.